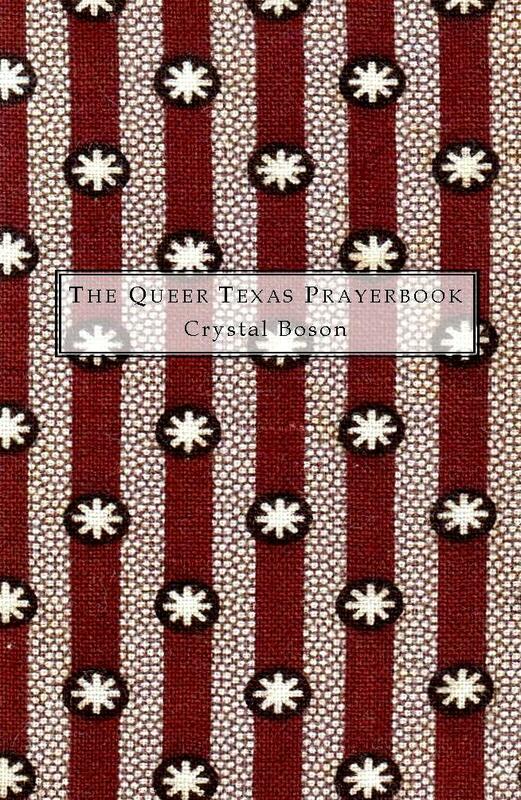 The Queer Texas Prayerbook: poems by Crystal Boson. Number 5 in Volume Three of our limited-edition Summer Kitchen Series. Crystal Boson is fascinated by Hoodoo, Black Sci-fi, roller derby, food mills, and the upcoming zombie apocalypse. She has been previously published in Callaloo, Pank, and The Black Bottom, and is in an anthology of Queer Midwestern writers. Her previous chapbook, the icarus series, was published by Seven Kitchens Press in 2009. When not writing poetry about Texas, bar fights, or existential love, she is a PhD student in American Studies at the University of Kansas. Crystal holds both a B.A. and M.A. in English Literature, from the University of Missouri and Texas A&M University respectively. She currently resides in Lawrence, KS with her Macbook, a basil plant named Lazarus and her cat, Delphina Jenkins Boson III.